Looking for a crock pot soup that still tastes gourmet? 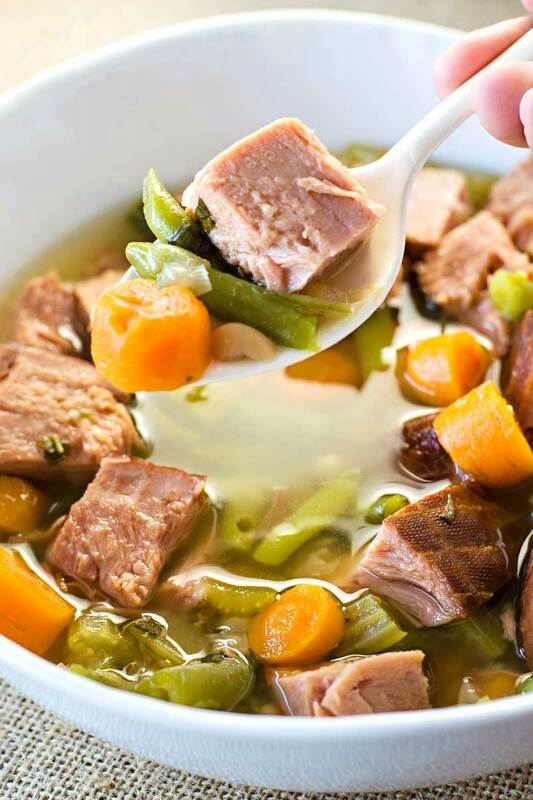 This ham and vegetable soup is an easy and flavorful dinner for any night of the week. Cooking for just The Husband and I does have its advantages: the cheaper grocery bills, less kitchen cleanup, and I get to be all romantic with those perfect “dinner for two” recipes. Sure, we may eat our dinner while sitting on the couch, watching TV (all of which we’re both totally okay with doing), but in the back of my mind I fully aware of just how stinking cute our dinner plates look. But as for the disadvantages of only cooking for two? Some of the best recipes out there are made to feed four to six, and it’s not always the easiest task to scale the recipes down (because, math). Quite often I’ll only cook the full-serving recipes when I know the leftovers will be decent – which just happens to be exactly how this crock pot soup ended up on our dinner menu. Now, the best part about this recipe wasn’t even the fact that it turned out awesome the day I made it – because it totally did, if I do say so myself; savory and tender ham, flavorful veggies and beans? Oh yes – but actually the best part about this recipe actually was the leftovers. And it wasn’t even me that got to eat them. Running this little food blog usually means we’ve always got good food around the house, and The Husband and I talk about him taking the leftovers to work with him all. the. time. But for one reason or another, it never actually happens. Either he’s out the door before I’m motivated or I’m already so deep in my work for the day that by the time he leaves it doesn’t even dawn on me pack up some Tupperware for him. That is, until the fateful day that I did remember. And not only did I remember, but The Husband walked out our front door with the crock pot and all the tools necessary to have an indoor picnic at his office. I was a little nervous about the whole thing (because I’m always nervous when it comes to other people eating food I’ve cooked) but it wasn’t even past the standard lunch hour when I got a text from The Husband confirming that the soup was already gone. They ate every last bit of it and they loved it. So as for this recipe, I can confirm that at least six people I know have given it a thumbs up. That’s a thumbs-up for every serving that this recipe makes. Pretty good if you ask me! In a large stockpot over medium-high heat, add 6 cups of water and the great northern beans. Bring to a boil and let cook for 10 minutes. Remove pot from heat, cover, and let beans sit for 1 hour. When ready, drain and rinse beans, then set nearby. In a 5 1/2 quart (or larger) crock pot, add smoked ham (whole), celery, carrots, black pepper, and prepared great northern beans. Pour in the remaining 6 cups of water on top and sprinkle with oregano. Cover and cook on high for 5 hours (or 10 hours on low). Add green beans to crock pot and cook on high for another 25 minutes. Remove ham from crock pot and cut into bite-sized pieces. Return cut ham to crock pot and stir in balsamic vinegar and salt. Ha! I have the opposite problem–I’m forever having to scale recipes up to feed our family of 6, especially if I want leftovers. I love a good soup that gets better with age. Too funny Kristen 😀 And this recipe definitely ages well. I already want to make it again just so I can heat some up for my lunches. I’ve been making a ham and vegetable soup for years. I use about 2 lbs ham. 1 large onion… 1 lb carrots and 1 kg. frozen California vegetables. 8 cups water with 2 tbsp of knorr chicken stock or to taste.. Pepper and bay leaves. Simmer in crockpot over night, around 12 hours on low. 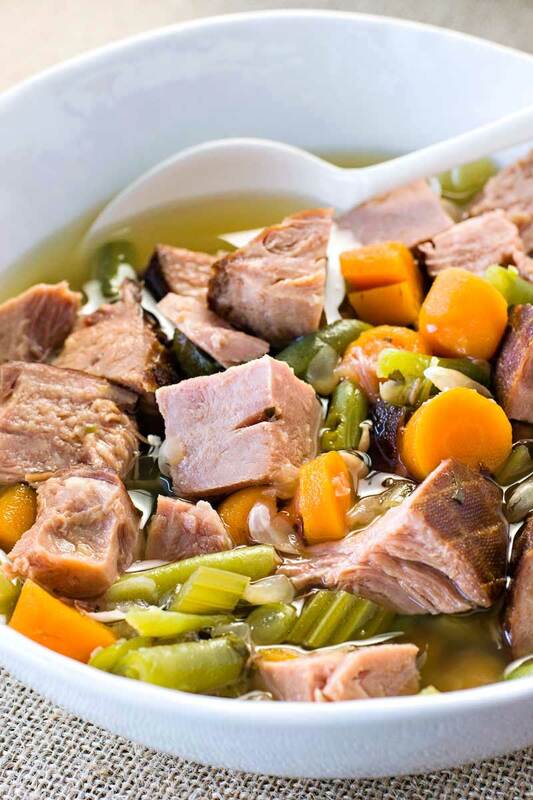 It’s similar to other ham soup and very quick to make. The flavor depends on the vegetables you add. If you’re a cabbage lover, I imagine that cabbage would make a nice tasting soup with ham. This soup is hearty perfection! Love all those veggies and ham…yum! This soup is the definition of hearty, and I’m kind of obsessing over it. Gorgeous and delicious and guaranteed to make my hubby and teenager smile at the sight of dinner. Love it! So very good…the only thing I added was a few shakes of hot sauce (my family loves spicy anything)…I definitely will be making this to take to my office crew! !